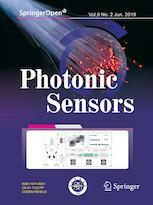 Photonic Sensors is a fully sponsored, double-blind peer-reviewed open access journal published under the brand SpringerOpen. It presents original, peer-reviewed articles that report on new developments of interest to members of the photonics and sensor communities in all fields of photonic sensing science and technology. The journal's coverage includes optical fiber sensors, planar waveguide sensors, laser-based sensors, and biophotonic sensors and more. Photonic Sensors focuses on experimental contributions related to novel principles, structures or materials for photonic sensors. In addition to research articles, the journal publishes letters and review articles, providing an opportunity to rapidly disseminate research results of timely interest, and comprehensive reviews of emerging topics. The publication costs are covered by University of Electronic Science and Technology of China so authors do not need to pay an article-processing charge. As authors of articles published in Photonic Sensors you are the copyright holders of your article and have granted to any third party, in advance and in perpetuity, the right to use, reproduce or disseminate your article, according to the SpringerOpen copyright and license agreement (https://www.springeropen.com/get-published/copyright/copyright-and-license-agreement).